Homes in ancient Egypt, just like other societies, was the basic unit of society. Ancient Egyptian homes were made in a variety of ways although the materials used were limited. The most common form of material that was used for the construction of homes consisted of sun-baked mud bricks. Stone was also sometimes used for building the impressive and significantly larger homes of affluent people. Unlike most other societies, wood was not used in the construction of homes or any other building because Egypt had a very dry climate and it was impossible to procure wood in abundance for construction. The History of homes in ancient Egypt extends well beyond the dynastic period in Egyptian history. During the earliest times, there were only mud houses for which mud was extracted from River Nile. 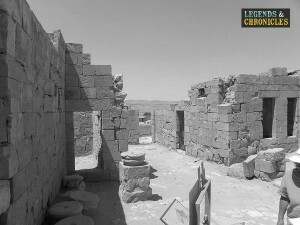 With the passage of time, stone also began to be used for the construction of homes. This was true before the old Kingdom but from this time onwards, stone was almost exclusively used for the construction temples and tombs and mud-bricks became the most essential component for the construction of Egyptian homes. Many of the ancient societies of Egypt were wiped out with time because they were flooded time and again by the water of River Nile. Different kinds of styles were used for Egyptian homes, mainly depending on the social status of the inhabitants. Huge homes and villas were used for the residence of the nobles and preference was also given in their location along River Nile. The nobles used the technique of painting their homes white to decrease the effect of the sun’s heat. Among the upper classes, it was also customary to paint the outside of the homes with white limestone. This made the houses sparkle in the sunlight. Different sections were reserved for guests, Children and other inhabitants of the house. The remains of an ancient Egyptian home. The ancient Egyptian homes of the common people who lived in the villages were not meticulously planned. However, the homes of the nobility were carefully planned by the builders and maps were drawn before construction. Instead of the lime plaster used by Greeks, gypsum and quartz were used in the construction of Egyptian homes. One thing that was common between the homes of lower and upper classes was the mud-brick. Bricks of uniform dimensions were used in the construction of peasant homes as well as large palaces and villas. The core of Egyptian society was the family and specific roles were reserved for both genders. The role of men was outdoor professions such as agriculture or trade. Women sometimes helped their husbands in agriculture but most of the times their role was confined to household chores such as cooking and sewing etc. There were specific terms in ancient Egypt for immediate relatives but no terms for such relatives as “grandmother” or “grandfather”. Instead the words reserved for mother and father were used for these relations too. The marriage age of males was between 16 and 20 on average during which they had generally established their career. Girls, on the other hand, were considered to be ready for marriage after their first menses. Inside the ancient Egyptian homes of nobility, specific sections were reserved for kids and adults which was an essential feature of family life. 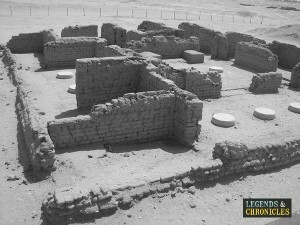 Many structure and homes in ancient Egypt did not survive to this day as this example shows. Egyptian homes for the poor people were considerably different from the homes of the upper classes. These homes were mainly made of mud and sun-baked bricks and their walls were rarely thicker than a single brick. Bricks were hardened by putting mud in the wooden moulds and leaving them under the sun. There was no meticulous planning involved in the construction of the ancient Egyptian homes of the poor. These mud brick homes were not very strong and would generally crumble after a few years. Average ancient Egyptian homes for the poor had two or three rooms and flat roofs. There were also farm houses which commonly had two floors. The upper floor were used as living quarters while the lower floor was reserved for crop storage. There was scarcely any furniture and people used to sit on the ground. Similarly, they slept on straw mattresses or rugs on the ground. There was a considerable difference between the Egyptian homes of the rich and the poor. The ancient Egyptian homes of the rich were very different from the homes of the poor people. To begin with, these houses were large and consisted of dozens of rooms. Due to the abundance of rooms, it was common to reserve different sections of the homes for different purposes. For instance, one section would be reserved for children and another one for guests, and so on. Part of the Egyptian city of Amarna, depicting what could well have been homes in ancient times. Design wise, it was very common to paint ancient Egyptian homes white by using limestone in order to make them look more beautiful particularly under the sunlight. One reason of painting the houses white from the outside was also to keep them cool. While mud-bricks were the most common ingredient of homes for the rich, they also sometimes used stone. The houses were usually built around a central courtyard where flowers and fruits could be grown. A lot of rich people also had wells in their homes as a source of clean drinking water. Unlike the homes of the poor people, the rich people also had toilets and bathrooms in their homes. Ancient Egypt was quite advanced with respect to construction and building homes. The fertile land of the Nile provided enough mud to be baked into mud-bricks and use in construction. These mud-bricks were the most important ingredient of the Egyptian homes of the poor as well as the rich. The rich, additionally, also made use of other ingredients such as stone, lime, and whitewash. There were also differences in size and structure of the homes of the rich and the poor. 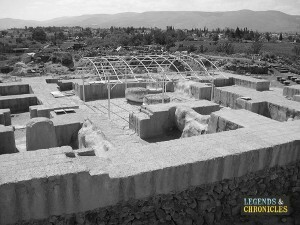 With the passage of time, homes with two floors also began to be constructed with the lower portion being used for crop storage and the upper one as a residence.